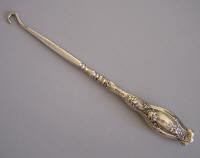 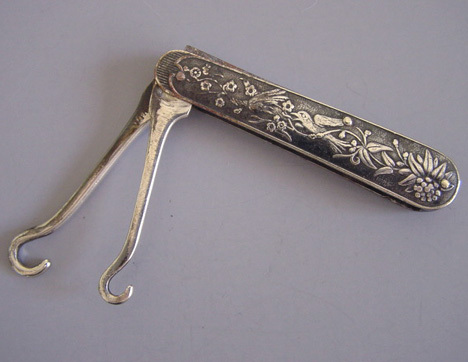 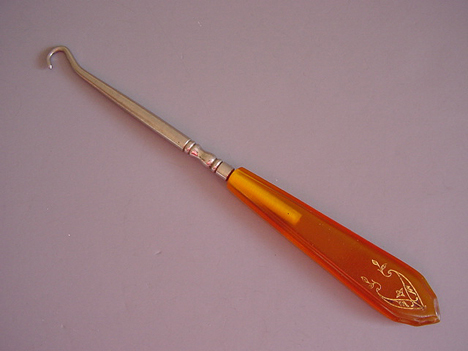 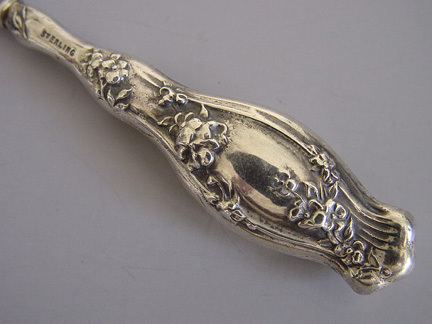 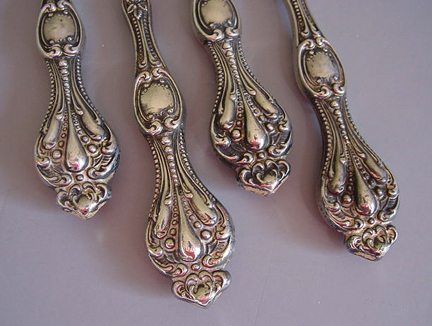 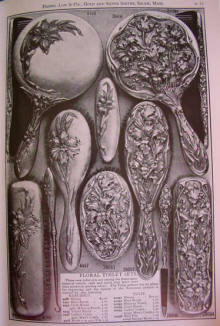 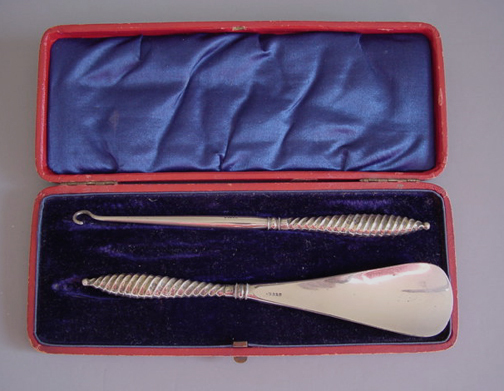 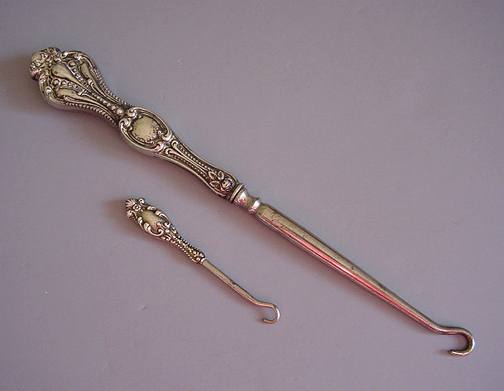 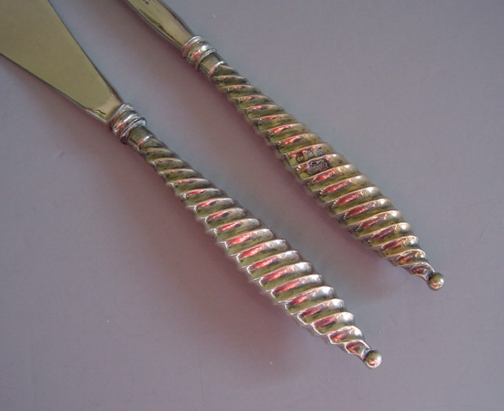 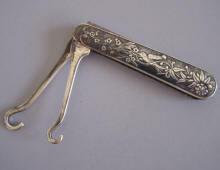 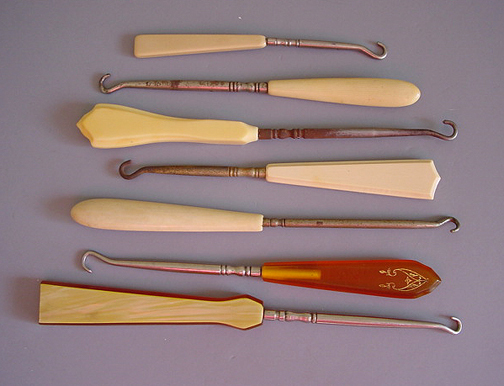 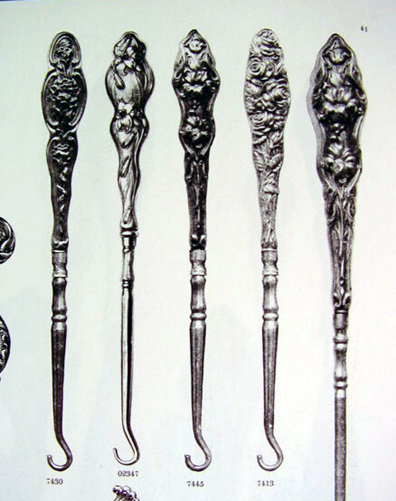 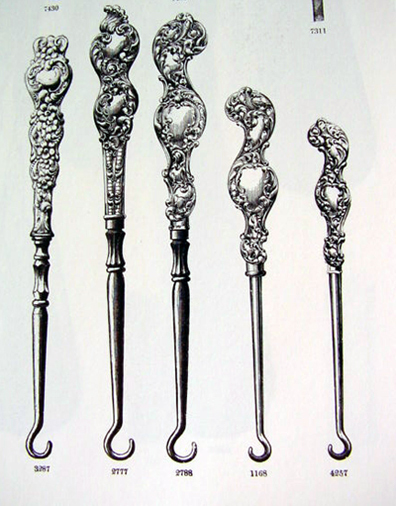 The Victorians had beautifully fashioned implements for every need. 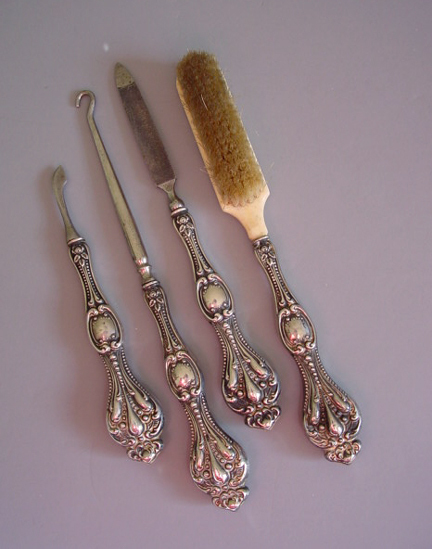 Their toiletry sets came in sterling, ebony, ivory and celluloid and they were decorative as well as useful. Many of their wonderful items would be useable today, but one tool for which we would have little use it the button hook. 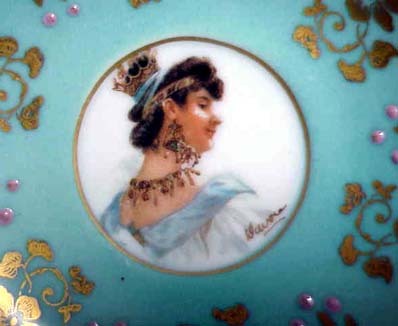 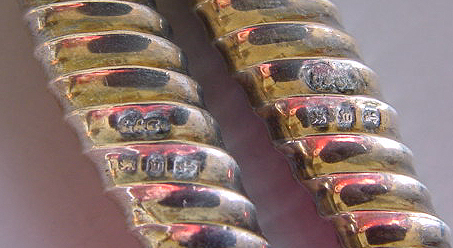 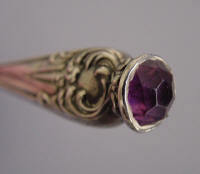 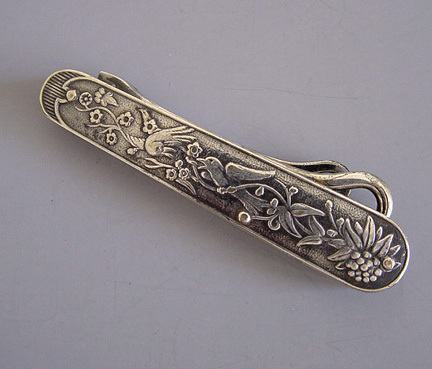 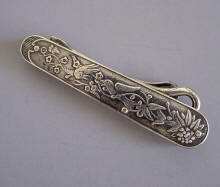 In spite of that fact, many collectors find them irresistible, with their elaborate handles and design. 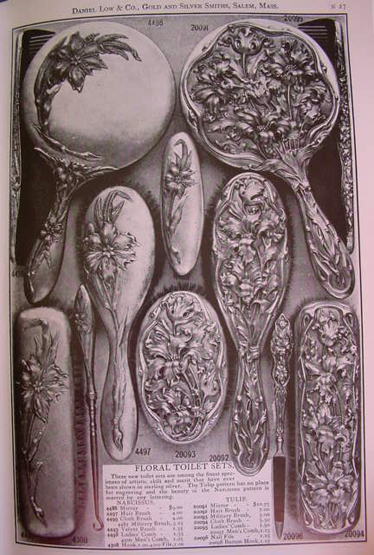 Showing "Floral Toilet Sets" in sterling, including mirrors, brushes, combs, nail files and button hooks priced from $1.00 to $10.75 each. 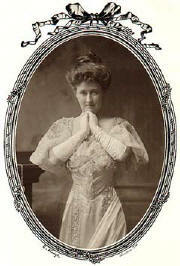 Lovely lady wearing elbow length gloves. 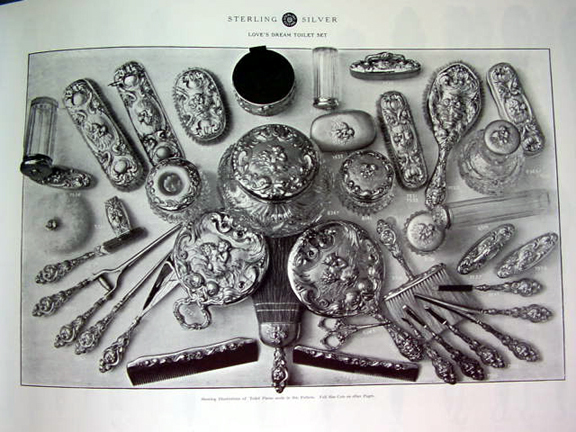 Showing "Ebony Toilet Articles with Silver Mountings"
Hooks were sold in sizes appropriate for both glove and shoe buttons. 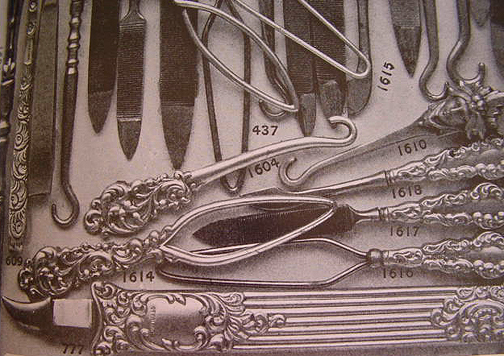 In the early 1880s a sewing machine used to attach buttons to high top shoes was invented. 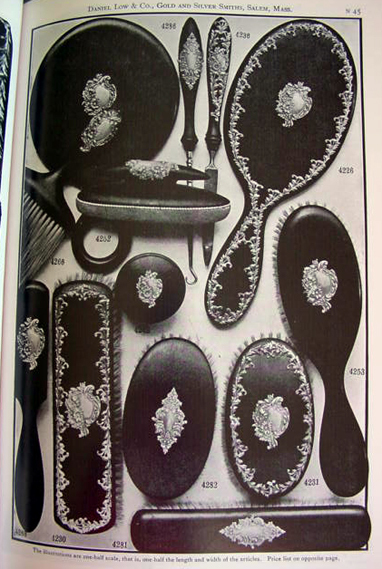 Shoe buttons themselves were usually made of fiber or glass. 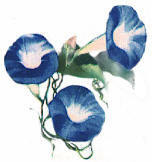 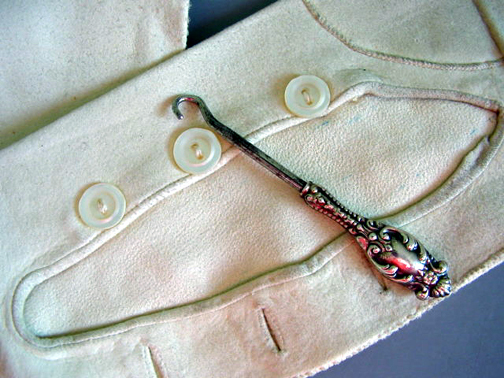 When World War I made leather scarce, high top shoes went out of fashion taking button hooks along with them. 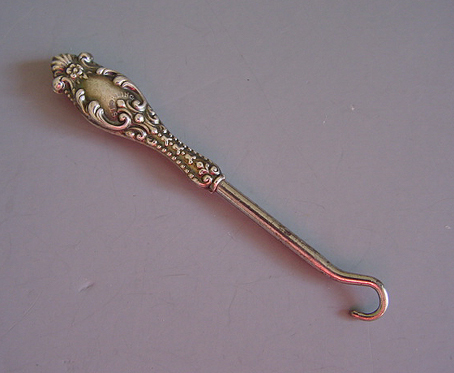 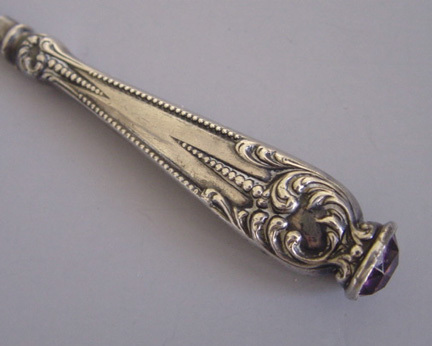 GLOVE HOOK sterling handled with ornate design, 2-1/2". 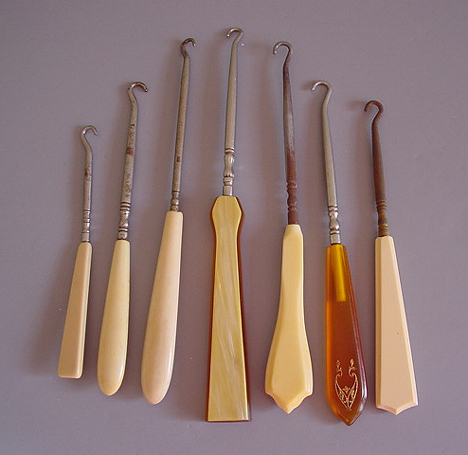 Both glove and shoe button hooks were used in the same manner, and both require a bit of coordination to use. 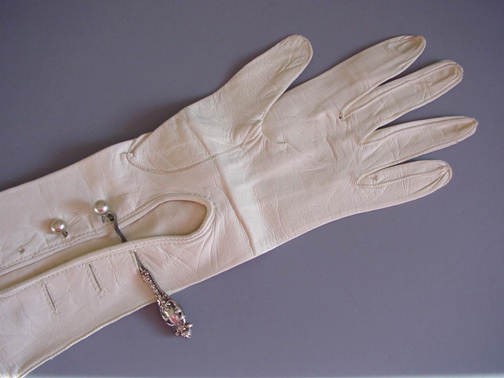 Ladies kid gloves fit snuggly, and came in wrist, elbow and full length. 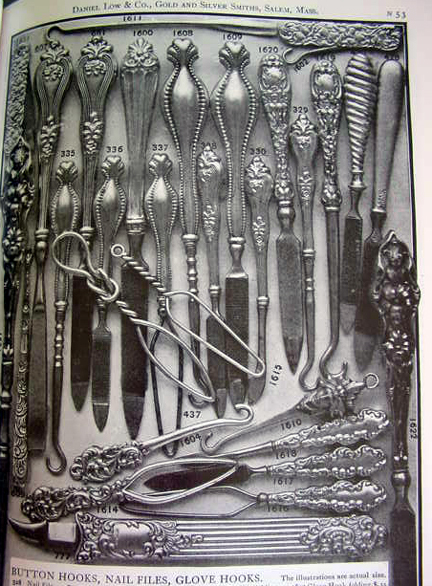 Each length was appropriate for a particular outfit and event. 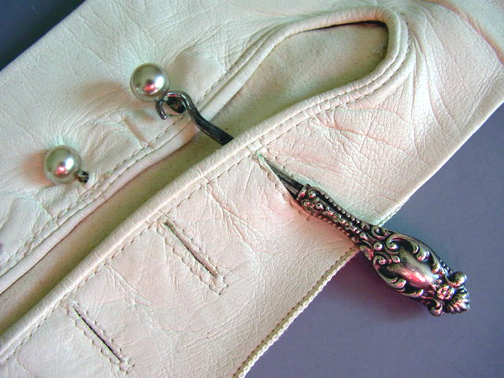 GLOVE hook with ladies kid glove. 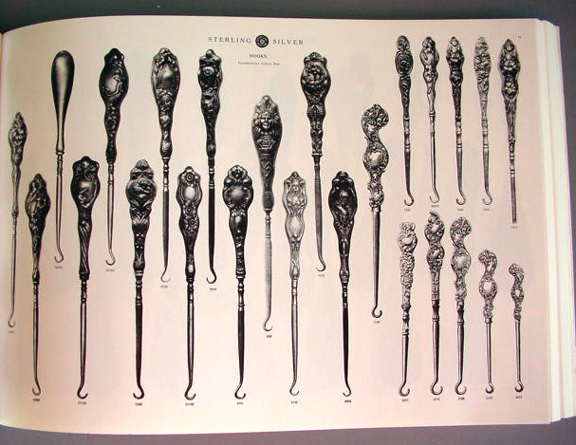 UNGER Brothers catalogue, 1904, showing their selection of button hooks. 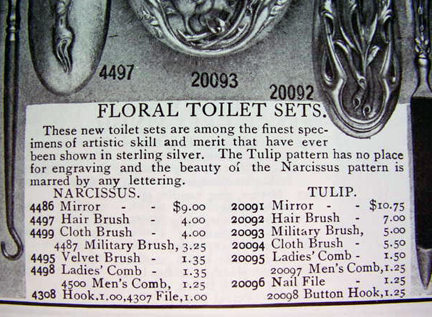 "Floral Toilet Sets", including mirrors, brushes, combs, nail files and button hooks priced from $10.75 to 1.00 each. 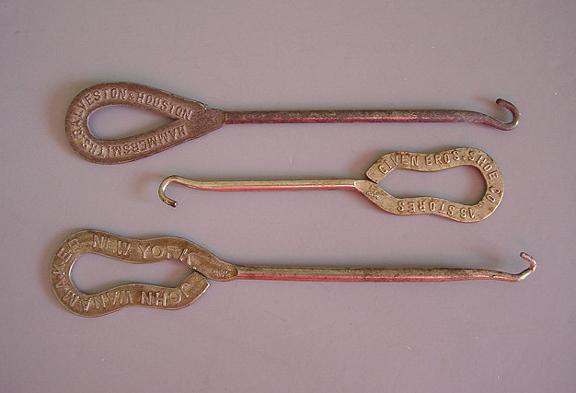 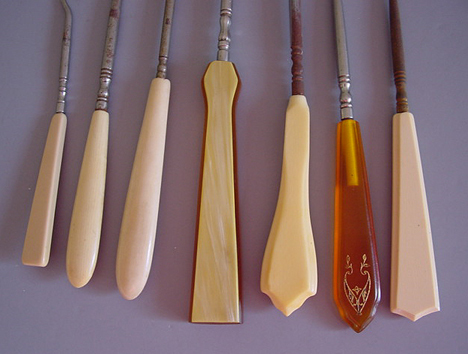 Showing several styles of button and glove hooks. 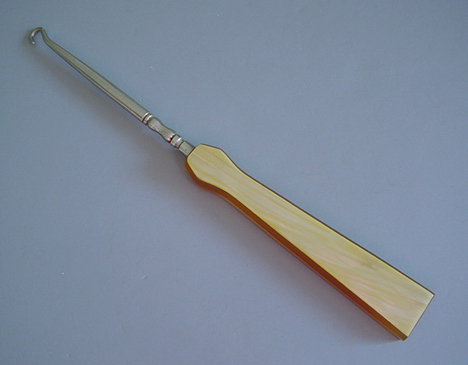 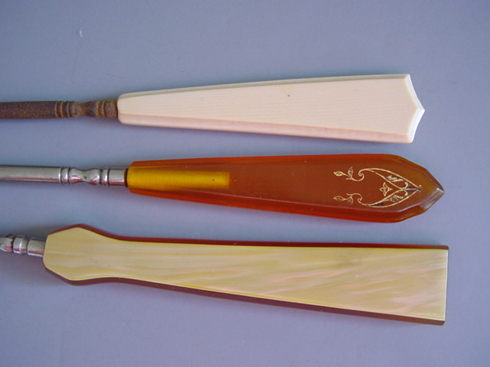 celluloid handle, marked "La Reine", 7-1/2"
plastic handle with gold design, 7"
with plastic handle marked "Acwalite", 8-1/4"
HOOK for shoe buttons with black plastic handle, 7-1/4". 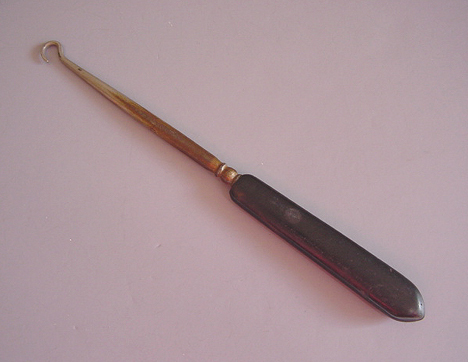 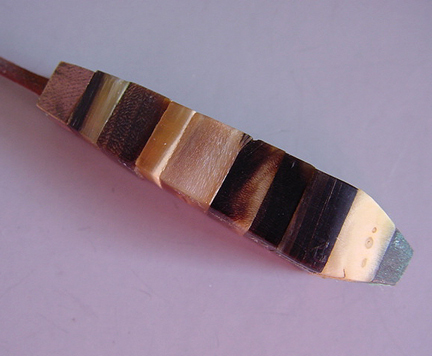 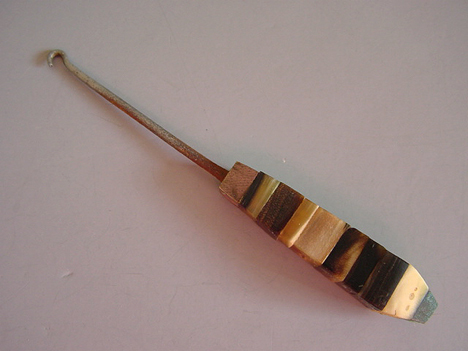 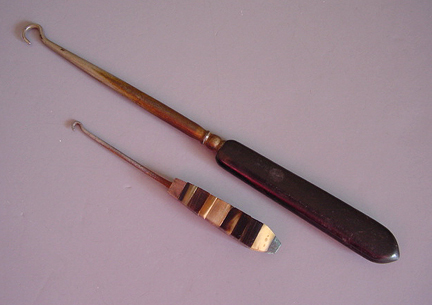 HOOK with plastic handle marked "Acwalite", 8-1/4". 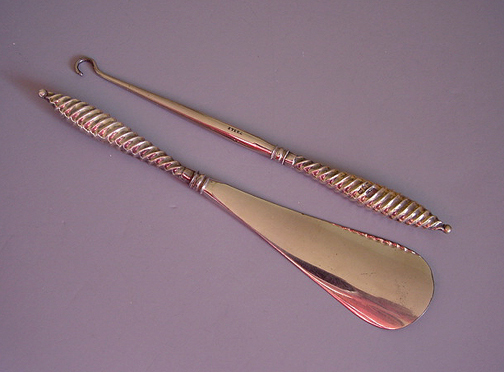 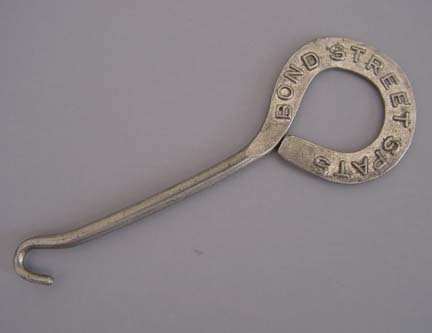 "Givens Bros Shoe Co, 16 stores"
"John Wanamaker, New York", 5-1/3"
HOOK plastic handle with gold design, 7". 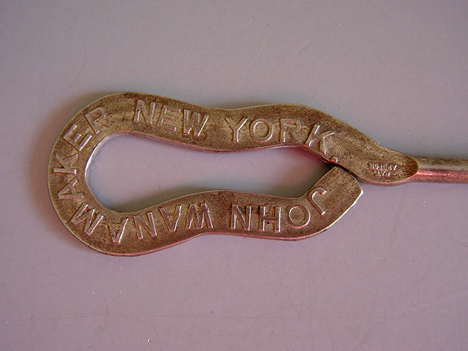 ADVERTISING "John Wanamaker, New York", 5-1/3". 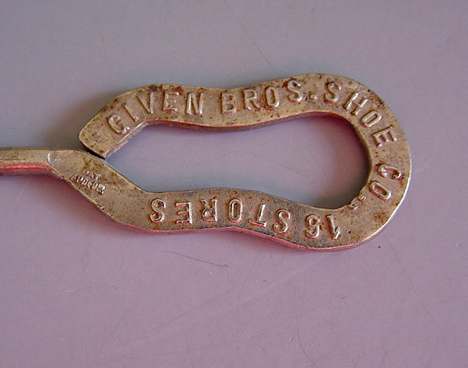 ADVERTISING "Givens Bros Shoe Co, 16 stores". 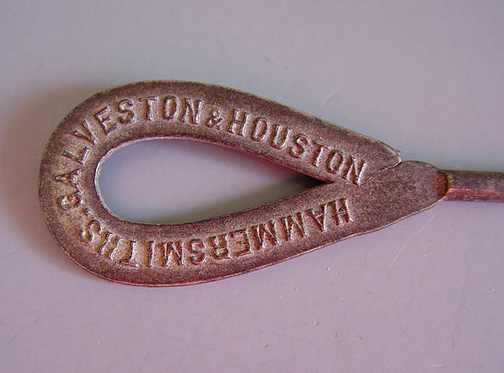 ADVERTISING "Hammersmiths- Galveston- Houston", 5-1/8".